This Is Where I Leave You opens in Australian cinemas on October 23 and is distributed by Roadshow Films. Now showing in the United States and opening in the United Kingdom October 24. You can see what This Is Where I Leave You is trying to do. You can also tell that it is trying really very hard to achieve this. However, Shawn Levy's latest film doesn't live up to all it can be despite how much it is trying. It is a film that has far too much going on to be emotionally effective and it's characters do not connect with the audience the way they should despite a stellar cast. There are sparks of the special film which This Is Where I Leave You could have been, but these sparks don't form into the fireworks which they should have been. After Judd Altman (Jason Bateman) finds his wife, Quinn (Abigail Spencer) in bed with his boss, he loses his job, his beautiful wife and his cool apartment all at once. When things seem like they could not get any worse, he receives a call from his sister, Wendy (Tina Fey) telling him that his father has just passed away. He makes the trek back to his hometown to be reunited with his mother, Hillary (Jane Fonda) and his siblings, Wendy, Paul (Corey Stoll) and Phillip (Adam Driver). As well as their father passing away, each of the Altmans have their own issues and in this emotional time there are confrontations as well as comforts. This Is Where I Leave You has wonderful intentions. It is trying to be a film that is sensitive and sympathetic to family death and the notion that families are made up of different personalities which are susceptible to clash at such a time when emotions are running high. Yet at the same time, it is trying to highlight the hilarity that can ensue when all these different people with so much happening in their lives are put under the same roof. However, This Is Where I Leave You lacks the emotional attachment that would allow these two to work in unison. With so much going on with so many different characters, the viewer finds that there is not enough time spent with each of them to be able to develop a connection and the scenes which should bring a tear to the eye instead feel lack lustre and close to empty. 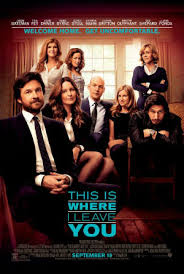 Even with Jason Bateman's Judd who is the lead character in the film, there is pity felt for him at the beginning of the film, but this connection is lost when the film is swamped by the rest of the cast. One comes away from the film feeling as though it is really trying to do too much and missing so much because of it. There are some laughs, but with a lesser cast the humour would be lost. In fact, many of the laughs seem unoriginal and worth more of a giggle than a belly laugh. While it's underlying premise of the dramatic meeting the comedic in such a situation is somewhat original (although it cannot avoid the obvious comparisons to August: Osage County), the film itself falls into several pitfalls which allow it to come across as rather predictable and often cliché, especially when it comes to Judd's ending. 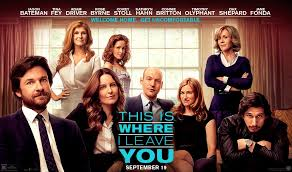 There is no doubt that the comedic timing and acting ability of the cast carries This Is Where I Leave You. The on screen chemistry between the cast members who are part of the Altman family is spot on and allows for the dynamics to be extremely realistic. What is great about the way the Altman characters interact with each other is that like adult family members, they start off speaking to each other like adults but the conversations often end with them acting and talking like they are their younger selves. It is something which people may not realise is a part of sibling relations as they mature. Conversations begin in the present, but inevitably turn towards the past. Jason Bateman does well in the lead and truly does as much with the part as he can. He has some moments of pure sadness, but the situations he becomes involved in throughout the film should allow for a greater variety of intense emotions to be exhibited. Although he is likable to an extent and has some witty dialogue, the audience leaves the film not feeling as though they really had a connection to or even knew who the lead character was. Tina Fey is pleasant and will delight anyone who is a fan of her previous work as her dialogue is delivered with the same wit and sarcasm she has became popular for. Wendy Altman is probably one of the more entertaining characters in the film, but again, not enough time is spent with her during her pressing situations to feel a real emotional attachment to her. Corey Stoll is fine, but his character of Paul could have been given so much more to work with and if he had, could well have been one of the most interesting in the film. Adam Driver is a lot of fun as baby of the family, Phillip. His inability to grow up and really be a man is endearing despite his questionable actions. Jane Fonda is very good, but doesn't have nearly enough screen time. This Is Where I Leave You has the best intentions, but tries to do too much with too many characters. The result is a film that lacks emotional attachment and doesn't have nearly enough laughs to make up for it.